On a vacation, I certainly am always looking for beautiful flora and fauna. I also made this card for Papertrey's Create with Us Challenge. I loved Heather's card here and came up with this version. Stamped, die cut and colored the flowers with copics. Embossed the top section of the card front and then added a strip of pp in garden green. Die cut a small white rectangle, stamped the sentiment, matted in green, and popped onto the front with dimensionals. Adhered the flowers . Stamps: Friendship Jar fillers Spring: PTI, sentiment: SU! Your card is very lovely! Your EF is quite unique! I love it! Great embossed background and how your flowers over hang the white panel. 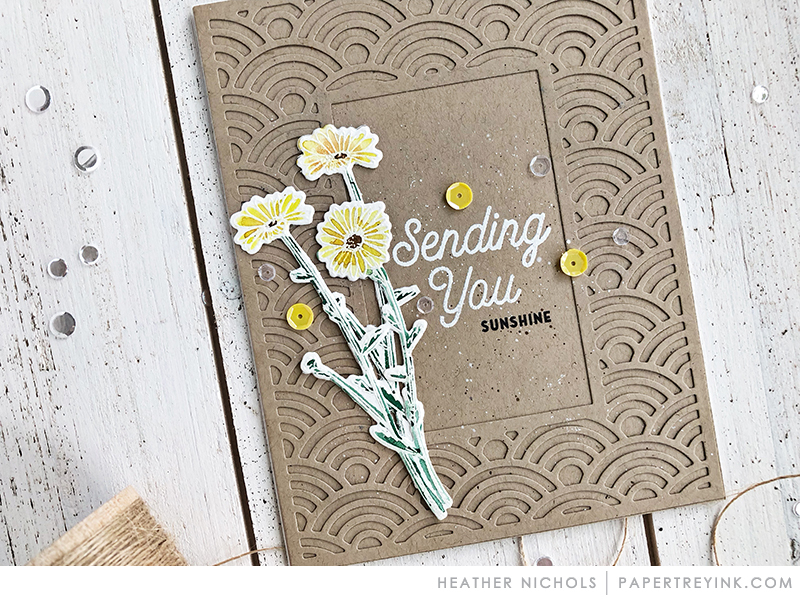 These wonderful yellow blooms are so cheery and look so striking splashed against this wonderful embossed bg. The sentiment with these yellow daisies feels so warm and heartfelt. ~Karen. Beautiful flowers and I love your color combo. Great embossed background too. What a fantastic embossed panel background for the gorgeous florals, Maura! Love the card design! This is beautiful Maura, I love your coloring, you should do it more often my sweet friend...let your solid multi stamp stamps take a rest. Heehee! Beautiful layout as well. I love hunting for flowers on vacation too and thankfully, so does hubby! Gorgeousness!!!! You already had me at yellow.